Words that Change Their Meaning Depending on Whether the First Letter is Capitalized are "Capitonyms"
There are some words that change their meaning based on whether the first letter is capitalized or not. These words are collectively known as “capitonyms”. These capitonyms are particularly troublesome when they appear at the beginning of a sentence, as there is no way, based on the single word alone, to tell which meaning is being referred to. 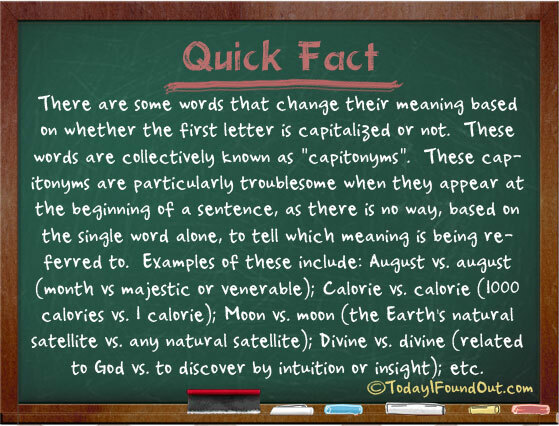 Examples of these include: August vs. august (month vs majestic or venerable); Calorie vs. calorie (1000 calories vs. 1 calorie); Moon vs. moon (the Earth’s natural satellite vs. any natural satellite); Divine vs. divine (related to God vs. to discover by intuition or insight); etc. Could you check whether the word “capital” is also capitonyms or not. If it is then it would be one sweet irony. You forgot one of the best examples: Polish, a person from Poland vs. polish, to shine one’s shoes.